Why play in a league? It’s difficult to pinpoint what exactly makes golf so exhilarating. Some of us live for its competitive edge; others golf to relax and escape, for some it serves as the perfect excuse to get out and enjoy the company of friends. Golf leagues conquer all of these. If you’ve never joined a golf league- here are the top three reasons to join one TODAY! 1. A golf league is fun! Sometimes we need to remember that golf is a game and is to be enjoyed. 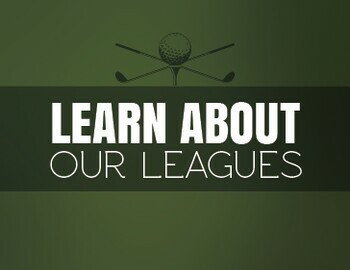 You’ll meet and get to know many other golfers through the duration of the league. A golf league is a great way to network for both friendships and business connections. 2. Friendly competition drives you to improve your game. Its human nature that none of us like to lose. The desire to golf well in league will produce more focused practice sessions. I’m not saying you necessarily need to be the best golfer in your league but you will feel the desire to improve your play in your league. Golfing with better golfers will actually help you improve your game by watching how they manage their way around the course. The key is to find someone to golf with who is better than you but not so much better that you are intimidated playing with them. 3. You have a weekly scheduled time to golf. We all live busy lives. Sometimes finding time to golf is challenging. By committing to play in a league, you are insuring you will golf at least once a week. Additional practice time on the range is very important, but just as important is golfing on a consistent basis. Your swing is just part of your golf game. Only on the course will you get the valuable experience in course management needed to improve your game. Leagues are a great way to further your enjoyment of the game, improve your skills, and fostering friendships. We host a variety of golf leagues and are also open to adding new leagues to our seasonal schedule. Please inquire through our website today if you are interested in joining one and we will reach out with specifics!